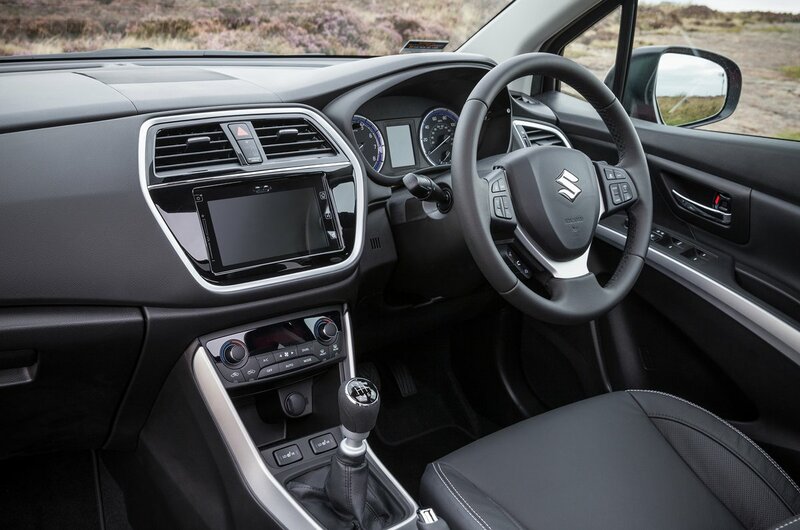 Suzuki SX4 S-Cross Interior, Sat Nav, Dashboard | What Car? The S-Cross’s steering wheel adjusts both for reach and rake, and every model offers driver’s seat height adjustment. The driver’s seat has three levers for adjustment; one for leg room, one for height and one for the backrest. The backrest adjustment isn’t ideal: it can’t provide such precise adjustment as a rotary wheel. Unfortunately, electric seats aren’t offered on any model, even as an option. The pedals on manual and automatic models line up nicely with the driver’s seat, and the seat itself provides enough bolster support in tight bends. However, it’s disappointing that lumbar support adjustment isn’t an option, let alone standard. The dashboard is split into two sections; the upper part contains the radio (or sat-nav if fitted) with climate controls dominating the lower. All the buttons are big and clear, so are easy to use on the move. All versions have an armrest. 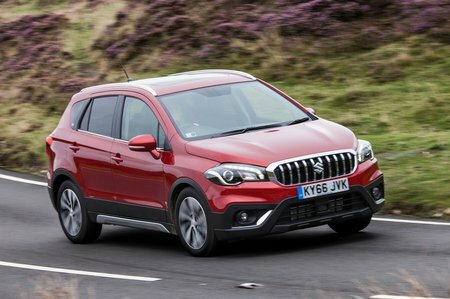 Thanks to the S-Cross’s tall, wide windscreen and slim front pillars, seeing forwards over the bonnet is easy. The generous front side windows help you see out at junctions and roundabouts, too. The view over your shoulder is good, thanks to rear pillars that aren’t particularly bulky and a good size rear windscreen. Front and rear parking sensors and a rear view camera are standard on SZ-T and SZ5 models, but it’s disappointing that neither can be added to the entry-level SZ4. 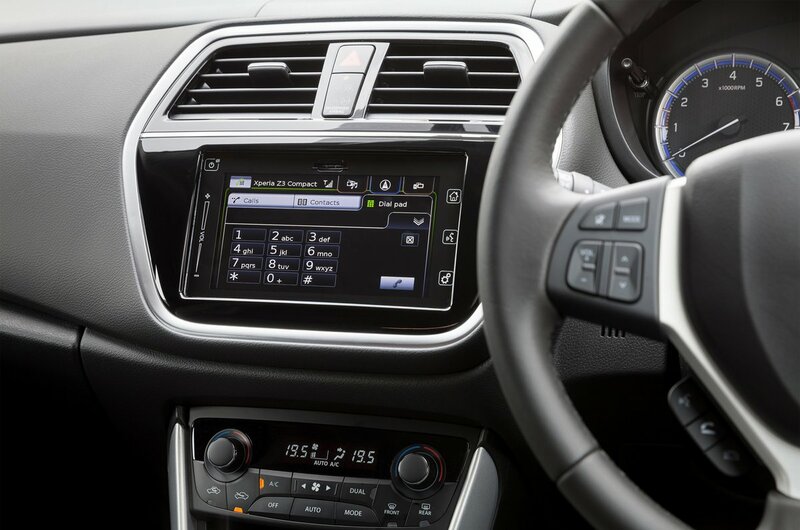 With a simple monochrome display flanked by two rotary dials and various menu buttons, the basic infotainment system of entry-level SZ4 models is easy to get your head around. A CD player, DAB digital radio, four speakers, Bluetooth, a USB socket and a multi-function steering wheel complete the package. It’s good, but even the most advanced S-Cross infotainment system isn’t quite as slick as that of the Nissan Qashqai, which offers mobile phone app integration. Given the S-Cross’s low prices, its quality feels about what you’d expect. It’s solidly built but feels quite downmarket in places. The top of the dash has a plasticky feel, but its face has a softer feel. The lowest trim levels seem to have the cheapest, scratchiest feel and, while there are plenty of chrome accents dotted about but it’s obvious these surfaces are painted plastic, rather than the real thing. Better news is that the buttons and controls are nicely damped.